« Our Week In Pictures! Hi! We’re in Rhodes! Not the Grahamstown one, though – it’s the tiny hidden village between the mountain cracks around Naude’s Neck, close to the highest point in the Eastern Cape. 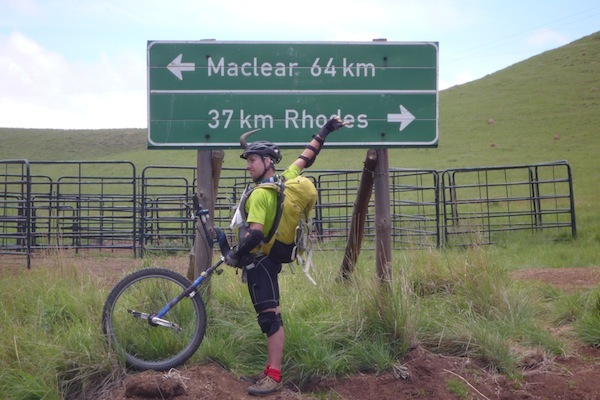 Well, Johnny and Alan scaled the tallest point of the Freedom Challenge route – by reaching a point 2,600 km above sea level, close to Naude’s Neck. The only point of reference that seems to make sense to anybody as to where we actually are is that we’re close to Tiffendale, a ski resort in sunny old Africa, which primarily makes Rhodes a holiday town. There aren’t even street names here – each house or Bed & Breakfast merely has a number that says “Roundabout Rhodes 23” or whatever. I think there may only be about 23 lots in Rhodes, to be honest. The road to Rhodes took myself and Donna about four hours to navigate from Maclear, where we’d stopped earlier in the day to collect some parcels sent to us, including my sweet little training unicycle (it’s so pink), and Brad Jackson’s awesome Magiclights. We are gonna be so nocturnally equipped, night-vision-wise, it’s not even funny. We almost didn’t leave Maclear, because the postmaster we met while waiting in the queue, while truthfully being sincerely helpful, seemed to be starved of conversation and without any obvious grasp of sarcasm. He creepily ushered us into his office, where he locked us in, made us sign for the package, and then spent about fifteen minutes carefully pouring over a hand-drawn map of how to get to Rhodes. Here’s how we know “Anne” (as his nametag read, no kidding) was being facetious, at best: he told us that the dirt road to Rhodes would get us there in “Oh, an hour, or an hour and a half”. I mentioned how it took me, Donna and the PeopleWagon four hours of narrow road-navigation, sharp drops, steep climbs, and next to no safety barriers, right? To First Car Rental’s PeopleWagon’s credit, the purple beast was very well behaved, and we ended up at Rhodes in one piece, without having to host another sleep-over in it. Have I implied enough times that the road to Rhodes was a long one? I mean, we’ve driven longer distances. We’ve been in worse conditions. Rhodes just became frustrating because we’d climb a hill and expect to see a town, and then see nothing. Then we’d reach the top of another hill and expect to see a village, and see nothing. And then we’d loop around another heap of basaltic lava rock and hope to see a farmhouse or something and see… nothing. Rhodes started seeming like a non-aquatic Atlantis. But we got there, eventually. And Alan and Johnny almost beat us – guys, these two covered the steepest climb of the tour, and have covered 83 km in just under 10 hours. That’s faster, and further, than they’ve done since the tour started. Remember how I was just complaining how far and steep the road was? From the comfort of a four-wheeled Toyota Quantum? Where all I have to do is maintain some basic clutch control and put my foot down the whole way? These guys did that, on one wheel each. After a poor night’s sleep. And some recovering health. 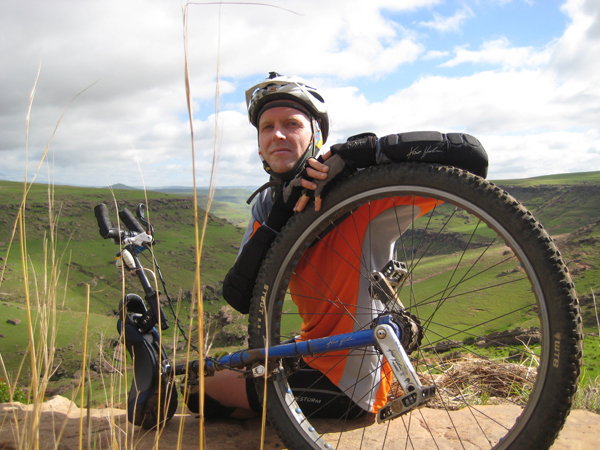 See, Alan got a little sick on Monday, and Johnny cycled 37km in four hours to Vuvu village, by himself. Alan was so sick, in fact, that we actually drove the guy to Mount Fletcher, the next-best “big town”, and found a public hospital. Al took one look at the waiting-room, and at the hunched bodies shivering under blankets, excused himself to use the restroom, and then off-handedly declared that we as in fact feeling much better and would probably be okay if he took a day’s rest and maybe just re-hydrated. As it turns out, he was right, as he and Johnny both proved to be one-wheeled machines on the road to Rhodes. Well, Johnny was probably worse-off than Alan yesterday – he wasn’t very well-rested. None of us really were. We spent the next night on the floor of a school in Vuvu. We were received by fairly confused pair of ladies who sort of vaguely indicated that they were going to try and split us up and house us “within the community” – while we didn’t want to feel unappreciative, our previous host house did give us the feeling that we were intruding and severely confusing innocent people. So, we tried a new angle – were there perhaps a few spare mattresses lying around? We could just whip out our sleeping bags and sleep in the school. It’d be cool. It’d be like a school lock-in, except less copying homework off peers and public humiliation. What started off as a novel idea to keep us all together ended up being an incredibly restless night’s sleep, because the slightest movement from any of us set a tidal wave of motion rippling through the mattresses, which had the effect of rendering us too afraid to move for fear of waking everybody else up, which was a redundant sensation since none of us really seemed to get to sleep at all, anyway. But we got through it together in one piece, and Rhodes, the Promised Land, our Day of Rest, was a day-trip away, and gave us the energy to brush our teeth and comb our faces with what we could and get ready for the day. Tomorrow we’re descending down to the beginning stages of our Stormberg phase, and we’re headed for the Karoo after that. 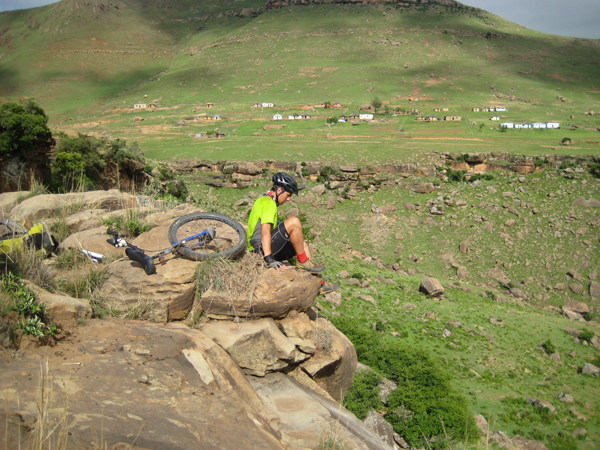 It should pretty much all be downhill from here – we can’t really go higher unless we go to Lesotho. Which we won’t be doing on purpose. Johnny and Alan are growing strong. They’re tired, but they’re doing better and better every day, Alan’s improved his navigational skills with maps from near-illiteracy to basic competence, and they’ve got radiating numbness in the buttocks, but they remain unbroken in spirit. We’re officially a quarter of the way done. But we still have 33 days to go. And we have a long way to go to reach our goal, and raise the money we need to buy 2,000 pairs of shoes for Bob’s For Good. We ask you to reach out, tell your friends, and spread the word of our crazy, crazy journey – these guys are doing something physically and psychologically incredible, for a noble cause, and we need all the help we can get to make this work. Thank you so much for your support, and for checking in on us! P.S – Please send regards to Johnny’s father, Neil, who has recently been involved in a serious hit-and-run accident. Our thoughts are with him and his family. Neil has firmly insisted, however, that Johnny continue and complete the tour – which Johnny intends to honour. 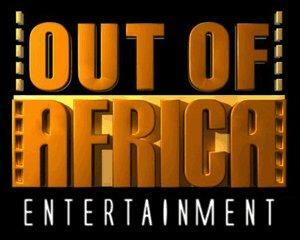 This entry was posted by on 08/12/2010 at 18:43, and is filed under . Follow any responses to this post through RSS 2.0.Both comments and pings are currently closed.